For the first few years after “getting saved,” Richard attended church regularly and really got involved. You could not keep him away. When the church met in any fashion or for any reason, he was there. He read his Bible consistently, and with real interest. The pages of the leather-bound gift from a believing friend overflowed with notes. Nearly every page had at least one underlined passage, and almost every week brought new questions and a sincere eagerness for answers. His zeal for Scripture resulted in his diligent pursuit of holiness in every area of life. The other men in his accountability group paid close attention to him in helping him overcome strongholds of sin in his life. It seemed as though Richard’s former vices, some of them regretfully common among men these days, were truly behind him. To any outside observer it would have appeared as though solid walls of protection had been built around Richard’s soul. He seemed to have everything a true believer considers valuable:strong confidence in his eternal security, an undisturbed conscience due to integrity in his daily walk, and a peaceful sense of dignity as a well-respected and faithful follower of Christ. In this sense Richard was a wealthy man, and growing wealthier every day. But then, at the approximate speed of ivy creeping up a brick wall, Richard’s enthusiasm and self-discipline began to morph into laziness and sloppiness. His affection for Bible reading and prayer becamea sense of obligation that often went unmet as he wearied of getting up early every morning. His evenings began to center less around the Bible and more around entertainment and leisure. This undoubtedly affected his early morning routine as well, as he discovered that the best programs on television are on later in the evening. Not recognizing the danger of his shifting priorities and affections, he reasoned with himself that he needed his sleep in order to be productive at work. He then justified that decision by determining to “get his Bible reading in” on his lunch break, but this rarely proved to be a time for profitable study. Somewhere during this period of spiritual drifting, Richard also began to opt out of “non-essential” fellowship times with his church. At first it was only for the reasons of illness or unavoidable busyness at work, but the illnesses that justified his absence became increasingly minor, and the busyness that took precedence began to include voluntary extra-curricular activities, like involvement in sports with his children. Eventually he found himself looking for excuses that would mask his own lack of desire for fellowship. When he felt up to it, he would attend accountability meetings with the men, but he now typically found these inconvenient. Strangely, he found himself resenting the loving exhortations from the other men, encouraging him to be more faithful. He even found himself secretly despising their enthusiasm for discussing Bible doctrines, also finding fault with their “over the top” passion for holiness, which he now saw as legalism. Before Richard fully recognized the danger, his lack of self-control had opened the door for his old enemy, lust. He found himself once again drawn to the Internet. At first it was just to kill time, but before long time-killing became secret enjoyment of getting close to what he knew he was supposed to flee. As one might expect given his carelessness, Richard’s formerly habitual activities once again became daily habits. His downhill drift had become an uncontrolled tumble. 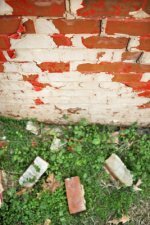 Where the ivy had been permitted to creep up the wall, large cracks and crumbling bricks now replaced its once solid features. Over time, one section after another collapsed, eventually becoming piles of rubble permitting easy entry rather than a solid wall protecting a treasure. I wish I could report that Richard eventually repaired his broken-down spiritual wall and turned things around, but that is not the case. Last I heard, he was hopelessly ensnared in an even worse lifestyle than he had left. I say worse largely because he was content to remain as he now was, having deceived himself into believing that he really was a Christian—that God would tolerate his pattern of unrepentant evil and would grant him entrance into His kingdom. The truth is, it had happened to him “according to the true proverb, ‘A dog returns to its own vomit,’ and ‘A sow, after washing, returns to wallowing in the mire’” (2 Pet. 2:22).